Fats have a bad rap. Oils, such as peanut and canola, are forms of fat that are commonly used in cooking and food preparation. People often love the flavor of foods prepared in oil, but they fear the fat. However, fats are an important part of a healthy diet, contributing to various essential bodily functions. For example, your body needs fats to dissolve and absorb certain vitamins. Problems with oils develop because all oils have a lot of calories, so overuse can contribute to obesity and risk of diabetes. Moreover, some oils have compounds that play a role in various adverse health conditions including cardiovascular disease and cancer. Peanut oil and canola oil each have advantages and disadvantages. When used sparingly and properly, these oils enhance the flavor and healthful benefits of your food. Oils that are high in monounsaturated fats can improve blood cholesterol levels, insulin levels and control of blood sugar. Likewise, oils with polyunsaturated fat can improve blood cholesterol levels, lowering your risk of heart disease, and can reduce the risk of type 2 diabetes. Omega-3 fatty acids, contained in some oils, are polyunsaturated fats that lower blood pressure, decrease the risk of coronary heart disease and reduce the risk of irregular heartbeats. Saturated fats, on the other hand, raise total blood cholesterol as well as LDL cholesterol, the bad cholesterol, and increase your risk of diabetes and cardiovascular disease. Trans fats are considered to be the worst of the lot. Trans fats decrease your healthy HDL cholesterol and increase your unhealthy LDL cholesterol. Canola oil is derived from the rapeseed, a cousin to Brussels sprouts and cabbage. Canola oil, usually ranked as one of the best oils, is among the lowest of all oils in saturated fat, and it is relatively high in polyunsaturated and monosaturated fat. Canola oil is also rich with essential omega-3 fatty acids. 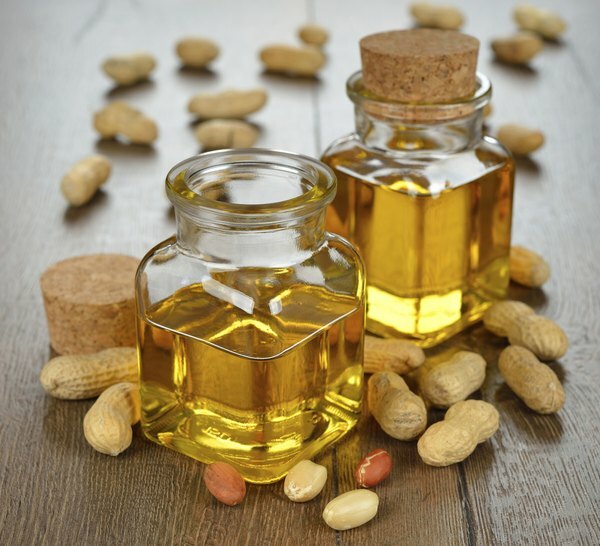 Peanut oil, derived from peanuts, is potentially deadly for those with nut allergies, but it is considered to be modestly healthy. While it contains more saturated fats than canola oil, it has high levels of beneficial polyunsaturated and monounsaturated fats. Though canola oil, with its lower levels of saturated fat and high levels of omega-3 fatty acids, appears to be superior to peanut oil, peanut oil may have the advantage when it comes to high-temperature cooking. The smoking point of oil is the temperature at which the oil starts to smoke. The omega-3 fatty acids in canola oil burn easily, giving canola oil a lower smoking point. When fatty acids break down, they turn into trans fatty acids, and the smoke contains an acrid, toxic compound that may contribute to risk of cancer. In contrast to the 400 degree F smoking point of canola oil, peanut oil has a higher smoke point of 450 degrees F. Canola is fine for baking, sauces and sautéing, but peanut oil may be preferable for high temperature cooking such as stir frying. The actual smoking point of oil varies depending on the particulars of its cultivations and processing and the purity and age of the bottled product. Because of this variation, you’ll find that charts from different sources give you different smoke points for any specific kind of oil. View any smoke point from a website, book or chart as a rough estimate. Most oils have a relatively accurate smoking point indicated on their labels.